Latte addiction is real, folks. Don’t let anyone tell you it’s not. 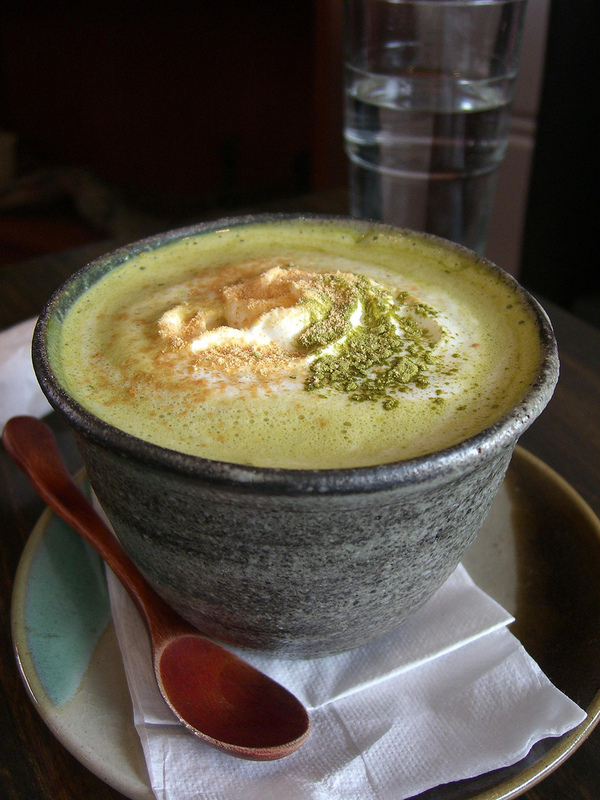 There was once a time in my life where I looked forward every day to visiting my local café, and ordering my “usual” from the barista – a large, perfectly creamy, delicious, and slightly foamy latte – with nutmeg (gotta have my nutmeg). In fact, as soon as I walked in the door, she knew what I was after and began preparing it so often when I got to the front of the line – presto! My latte was ready. I would have been insulted at her assuming I was so predictable, if not for the fact that I always got the same latte before work. And I always enjoyed watching her work her magic too, and calling it magic is no exaggeration here, as her latte-making was very similar to a magic trick in my eyes. Her hands would just fly through the air, behind her back, moving so fast – and then what-bam-here’s your latte to go, sir! (She always calls me “sir”, which is ridiculous). She apparently went to barista school, so it makes sense she seems to move through the process so effortlessly. Anyway, after two years of the same routine, I finally had to face the truth. I had a latte habit that was costing me roughly $150 per month. I’m talking bills were not being paid because of my love for the latte. The real intervention was when my girlfriend sat me down and told me that she’d been tracking my latte-spending, and it had gotten out of hand. We were on a tight budget at the time, and so when I looked at the calculations for my spending I felt pretty bad. I felt like I had been outed as a greedy latte addict, and I guess maybe I was. Clearly, something needed to be done. Well, call me passive-aggressive, but rather than just “cut back a bit” as she suggested, I made it my mission to simply make lattes at home, in order to save money. We don’t have an espresso machine, so I had to figure this out without one. Luckily, YouTube was my friend and I became a solemn latte-studying monk for the next little while. 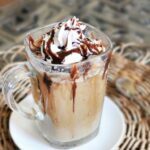 Now, 1.5 years later, I am proud to say that I can make a latte at home with no espresso machine that compares to and even sometimes beats the quality of the lattes I got at my local café, and this is what I wish to share with you today – what I am calling the “Best Homemade Latte Recipe” (yes, I do have an inflated ego now when it comes to lattes, like the true coffee hipster that I am). Here’s one of the videos that got me started on how to make a latte at home. When frothing, I use the Aerolatte milk frother as my weapon of choice. Now just know that this above info is NOT the recipe per se – I’m getting to it, but first I just wanted to give you a few things to take note of as I did when I was figuring out what I was doing. It definitely takes time to master the art of latte-making, and I myself took copious notes and had to go through much trial and error before I ever made a latte that I would say tasted anything like my favorite baristas creations. I must admit, just because I was going to make lattes at home did not mean I was going to do them without any assistance whatsoever. After feeling pretty guilty about my spending, I think the hardest thing for me to rationalize at that point was buying some kind of expensive latte-making equipment. At the time, I didn’t think you could really get a good espresso machine for under $200, so I was looking at other machines. That’s when I lucked out and came across the Mr. Coffee BVMC-EL1, which is a home unit that I’d heard was a great little latte maker for the price. I had to do some budgeting and show the paperwork to my girlfriend before she would agree to me running out and getting it, but once she signed off, I was on the ‘net buying that sucker. The great thing about the Mr. Coffee BVMC-EL1 is that most of the work is done for you. 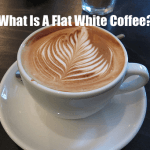 It acts just like a coffee maker, but with the added latte-making function of frothing and heating the milk as the coffee percolates and is infused with the milk. Its an all-in-one system which I definitely recommend to anyone who is looking for a simple solution to making a latte at home. You will definitely save money too, as this machine, while not the most durable on the planet, is no piece of junk either. I used it for over a year and it still works fine, and it managed to save me probably $500 over the year, which ain’t bad. Here’s a video showing the Mr. Coffee BVMC-EL1 in action, and how it makes a latte in real time, which is about 5 minutes. Not bad, and once its going you don’t have to keep your eyes glued to it or something bad will happen – on the contrary, it takes care of itself and shuts off when your latte is ready. As you can see from this video, the Mr. Coffee BVMC-EL1 is dead easy to use and I definitely think its a great way to go to make lattes at home if you want to save money. You can click the link below to jump over to Amazon and get more info on the Mr. Coffee BVMC-EL1. As far as easy solutions to making lattes at home, you won’t be disappointed. All that said, using the Mr. Coffee BVMC-EL1 is not how I currently go about making lattes at home, because of a few reasons. 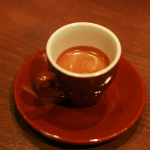 For instance, when it comes to espresso, the guy in the video mentioned his trip to Costa Rica and how they said that espresso is defined by its roast. Hence, you can simply buy espresso whole or pre-ground beans and, aside from some milk, that’s all you’re going to need. Well, I have always been under the impression that espresso is defined by the brewing method, not the roast per se. Sure, some beans make for better espresso, but what really defines the difference between coffee and espresso, more than anything else, is how you brew it. In other words, you need to use a good quality espresso tamper to tamp down the coffee grinds into a portafilter (preferably a bottomless portafilter), and then you need to run pressurized steam through the brew group in order to be able to call the resulting liquid espresso. What I’m using now to make my lattes at home is, like I said, not the Mr. Coffee machine, although it works fine and I have no real qualms about it. 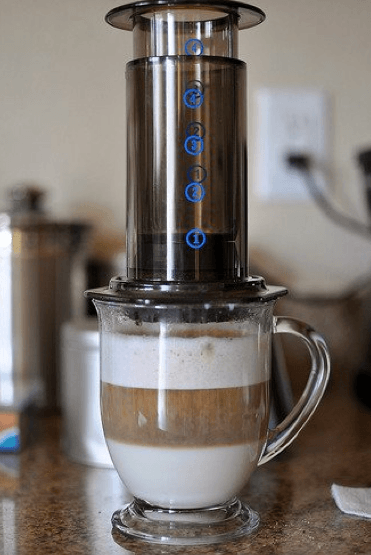 However, I wanted something a little closer to what I consider to be actual espresso for my homemade lattes, and so this involves two things which I have found to be crucial in the process – a coffee grinder and an Aeropress. As it turns out, after using my Mr. Coffee Latte Maker for about a year, and saving some dough, I was able to “reinvest”, as they say. I guess I could have gone on a latte binge and spent a month or so hitting up my old haunt, where my favorite barista still works but hasn’t served me an espresso lately. But no, rather than go back to my old ways after a year, I decided to up the ante and buy the two things that seem to be most important that I was missing from my rig at home. 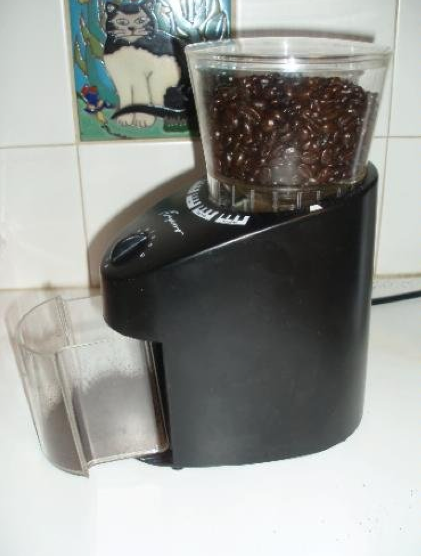 What I needed first was a coffee grinder to make sure I was grinding properly for espresso. The thing is, you can’t make good espresso at home unless you have the right grind for it. Because physics. If the grinds are too coarse, it doesn’t matter how you brew it – you won’t be able to get any espresso from coarse grinds. And so, being that I planned to make my own espresso to make the perfect homemade latte, I needed the right coffee grinder. The Capresso Infinity has the reputation of being the best conical burr coffee grinder for under $200 in some circles, and so that’s the one I purchased. It so happens that they had one for sale at my local café, so I was able to buy it while I was buying my other favorite drink – a double-shot Americano. Once I had the Capresso Infinity on my counter, I needed to learn how to grind for espresso properly. For that, I consulted this article and it taught me a few things on the topic of grinding. Here’s a video with more tips on grinding from Whole Latte Love that is quite useful. Yes, it did take me a while to get the hang of grinding my coffee beans just fine enough for espresso, but I eventually got the hang of it. At the same time, I had picked up an Aeropress Coffee & Espresso Maker, and I was going to try to use it to make authentic espresso at home, which made me a little nervous actually. With that in mind, I pulled up this video and watched it. I’m really glad I came across this video, because I definitely learned a lot very quickly from this guy – especially his double filter tamping method with the chicken spices technique that he uses. It does make a huge difference though, so you should try it! 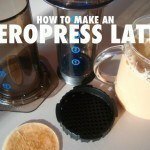 Ok, so rather than go through the ins and outs of Aeropress coffee making, I will refer you if you’re interested to this highly informative post on this website called “Aeropress Tips“, which should give you a lot to mull over when it comes to how exactly to use your Aeropress. 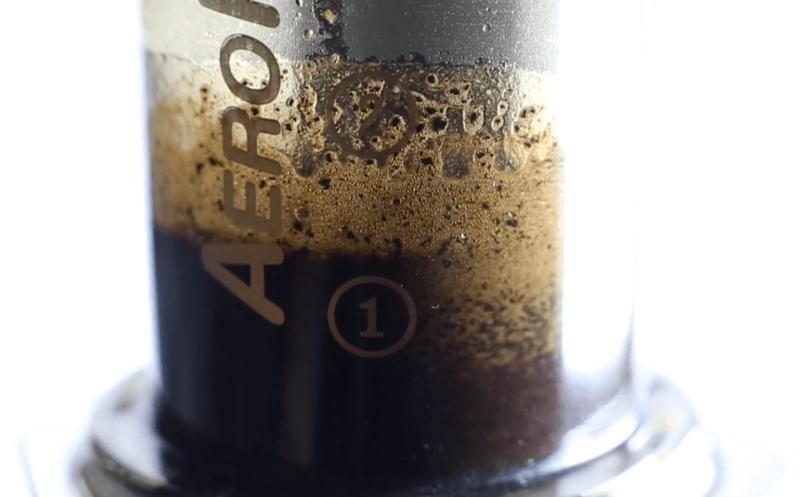 The great thing about the Aeropress coffee maker is that its really cost, and like Casey from the video says, if you do it correctly, you’re 95% of the way to getting authentic espresso flavor from your Aeropress. Here are the instructions. You may have to do this a few times to get it right, but its totally worth it. The whole process might take you 10 minutes maximum but during that time there’s going to be a whirlwind of activity, so get ready. Actually, its probably best if you just read this recipe over before you just go and do it, since there’s quite a few steps. The good thing is if you can pull this off, you’ll be the home made latte master in no time. If you’ve come here just to make a simple latte, you probably won’t have even read this far as it is evident how to do so in earlier videos. 1. Grind your fresh whole coffee beans (preferably an espresso style bean like Lavazza will do nicely) so that the grind is fine enough to make espresso. Fresh ground coffee gets stale pretty fast as the oxygen basically attacks the small particles, but you can leave the grinds there in the grind bin for a minute while you follow the next steps. 2. Start heating up your water. 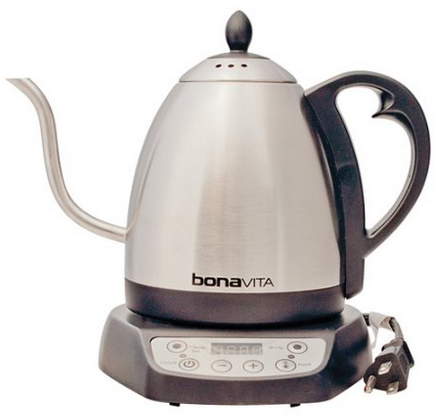 I use a Bonavita gooseneck kettle (read the review here) to control the pour a little better and irritate the grinds less. A good espresso thermometer can be used here to check the temperature if you’re just using your stove, but the Bonavita here has it all figured out. 3. Time to heat up your milk while your water is also heating. There are a few ways to do that, obviously, and I just happen to use the stovetop method to heat my milk instead of the microwave. I want my milk hot, but not boiling hot. 4. Transfer the milk to your favorite latte serving cup, leaving some of the foam behind momentarily. Why leave foam behind? You’ll see in a second. At this point your water will be nearing the boiling point and so you want to time it so it either comes to a boil and then cools off, or doesn’t reach a boil. It just can’t be too hot because that will adversely affect the flavor of your fresh ground coffee, which, at this point, should be sitting in your Capresso Infinity’s grind bin or somewhere nearby, losing freshness with every passing moment. That’s ok, it can wait a couple minutes – but not long! 5. Take two full level cups of fresh ground espresso and add it to your Aeropress. I use the tamping method in the above video (using a cylindrical object to tamp down) and then I also add the filter on top of the tamped grinds before I add the hot water on top of all that. If all is well, the water should be hot but not too hot and ready to pour over your grinds to make your espresso. This is where that gooseneck kettle can come in very handy. 6. Once you get to this stage, its all about “pulling a shot” of superb espresso with your Aeropress. This will take some time to master, but I believe you’ll get there! Even when I royally botched it a few times, it was still enjoyable to learn how to do it. By the end of this step here you should now have your espresso hot and sitting in a vessel of its own. Normally, if I was to not be making a latte, I would just press down into my favorite mug, but since its more important for the espresso to be made fresh and added right away, we have it so that your milk is waiting in your favorite mug for the hot, fresh espresso to be added to it. 7. We’re almost there! Add your espresso to your milk. 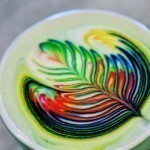 At this point, your latte should be looking delicious, with some cool-looking layers. If you’re a fan of foam, grab the pot from the stove and spoon the remaining foam on top of your latte. If you did this correctly, your latte should at least taste very, very good, if it doesn’t look to great the first couple times you try it. 8. Add cocoa, cinnamon, or nutmeg if you want to give your home made latte some razzle dazzle. Use some type of natural sweetener to sweeten things up. If you don’t mind my saying so, don’t go with white sugar. I like vanilla extract, honey, or brown sugar. Thanks for reading, and we’ll see you next time. Mr. Coffee BVMC-EL1 Cafe Latte Maker is really great as it’s so fast that I can have a small pot of latte in just 5 minutes.